If you, like I, sometimes get disheartened by the human evil and corrupt times in which we live, this account by the prophet Isaiah is a reminder of one of God’s wondrous creations, and that this world isn’t all there is to reality. Even our physicists tell us there are multiple dimensions, as many as ten, way more than the three-dimensional world we access with our five senses. Note: Uzziah, aka Azariah, was a king of the ancient Kingdom of Judah, who ruled for 52 years until about 750 BC, when he was struck with leprosy for disobeying God (2 Kings 15:5; 2 Chronicles 26:19-21) and his son Jotham took over as king. Uzziah died in 740/739 BC. In things which sense cannot discover, analogy is the great rule of probability. Thus, finding in all parts of the creation, that fall under human observation, that there is a gradual connexion of one with another, without any great or discernible gaps between . . . we have reason to be persuaded that, by such gentle steps, things ascend upwards in degrees of perfection . . . . Observing . . . such gradual and gentle descents downwards in those parts of the creation that are beneath man, the rule of analogy may make it probable that it is so also in things above us . . . and that there are several ranks of intelligent beings, excelling us in several degrees of perfection, ascending upwards towards the infinite perfection of the Creator. 1st hierarchy: Seraphim, Cherubim, Thrones. 2nd hierarchy: Dominions, Virtues, Powers. 3rd hierarchy: Principalities, Archangels, Angels. Of the nine angelic orders, five are sent by God for external ministry among bodily creatures, as indicated by their names of Virtues, Powers, Principalities, Archangels, and Angels—all of which refer to some kind of administrative or executive office. Of these five orders, only the last three (Principalities, Archangels and Angels) minister to human beings. Our guardian angels belong to the last angelic order. The word “seraph” comes from a root meaning “to burn.” Cherubim are first mentioned in the Bible in Genesis 3:24, where Adam and Eve are expelled from the Garden of Eden and two cherubim are sent to guard its gate so that no one may enter. In her visions, German mystic St. Hildegard von Bingen saw the seraphim as “burning . . . in the love of God . . . as if they were a fire” and the cherubim as having “the purest, clearest, and most profound knowledge” of God in which “they see the secrets of the heavenly mysteries.” (Hildegard von Bingen’s Mystical Visions, p. 72). The end days are real. Both the Old and New Testaments warn about it. The laws of science also support the notion that there will be an end to all things. It’s called the second law of thermodynamics, which states that an isolated system such as the Universe, that is, one that does not exchange heat or work with its surroundings, spontaneously evolve towards an end state of maximum entropy — of chaos and disorder. The process is irreversible. In truth, the end of the world comes to each of us when our mortal bodies die. So, live each day as if it may be our last. Be right with God, so that we might join the ranks of the Good who “shine brightly like the splendor of the firmament”. In the meantime, before we meet our end, we are to live each day to as “those who lead the many to justice” and we “shall be like the stars forever”. There is a very old icon or painting of St. Michael the Archangel in the Sacred Church of the Archangel Michael at the Old Cemetery of Ialyssos in Rhodes, Greece. The church is Greek Orthodox. The painting dates to 1896. Beginning in 2013, the painting weeps. The [Orthodox] Metropolitan, after indeed verifying there were what looked like tears on the face of the Archangel, asked for the icon to be moved from the place it was hanging. They then examined the back side of the icon as well as the wall on which it rested to determine if there was moisture which passed on to the icon. 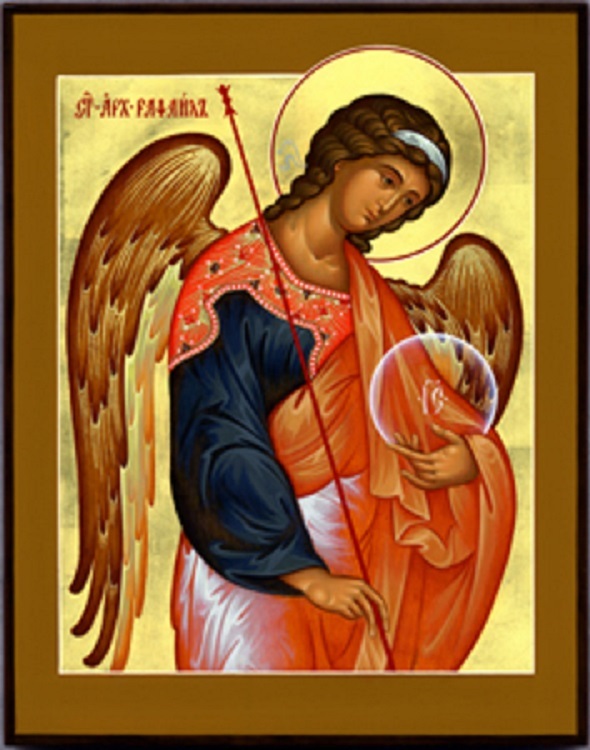 About St. Michael the Archangel, see “Feast Day of the Archangels“. See also “A soldier’s encounter with Michael the Archangel”. Today is our Guardian Angels’ feast day! Today is the feast day of our Guardian Angels! 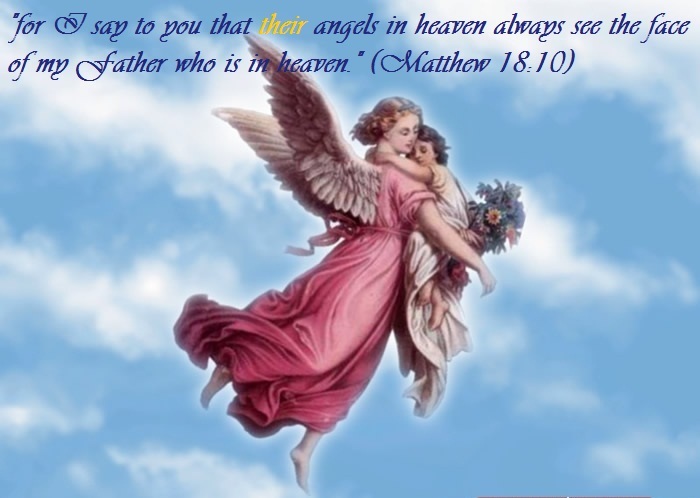 A 2007 Harris poll found that 74% of U.S. adults believed in angels. 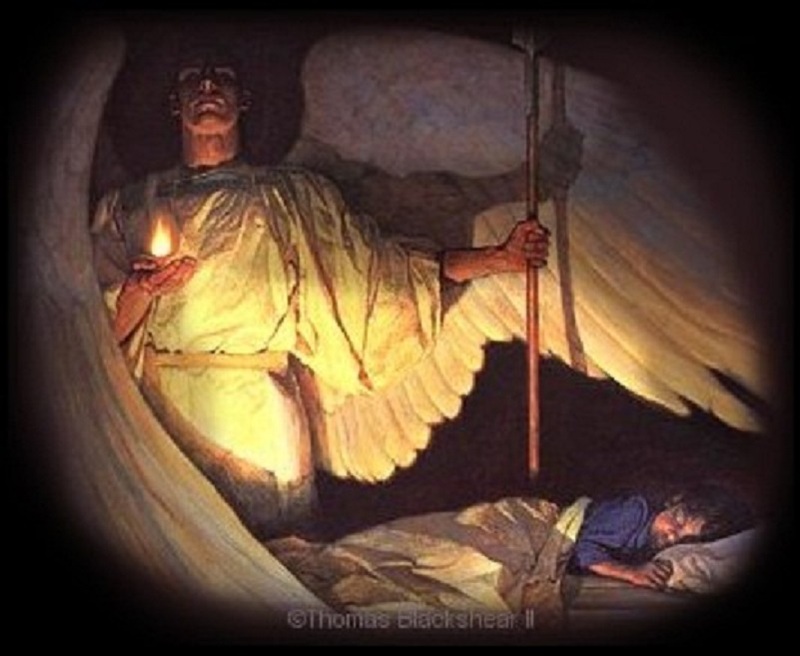 How do we know that each of us has a guardian angel? Because Jesus tells us so! Angels are incorporeal (without body, material form or substance) spiritual beings who act as messengers and intermediaries between God and humanity. St. Augustine said that although Angels are defined by their function as messengers or message-bearers, their activities are not limited to just this function. Messenger is one of their functions, not their nature. St. Thomas Aquinas maintained that each Angel is unique, a species unto itself — truly a mind-boggling idea. (J.R.R. Tolkien probably had angels in mind when he fashioned the Ents, who are each a species unto itself.) That means each Angel is truly an individual, with his own personality and quirks. This may explain why some guardian angels are pro-active, while others are not. Principalities are in charge of the whole of humanity. Archangels minister to nations — their leaders and those persons whom God tasks with special work to do on Earth. 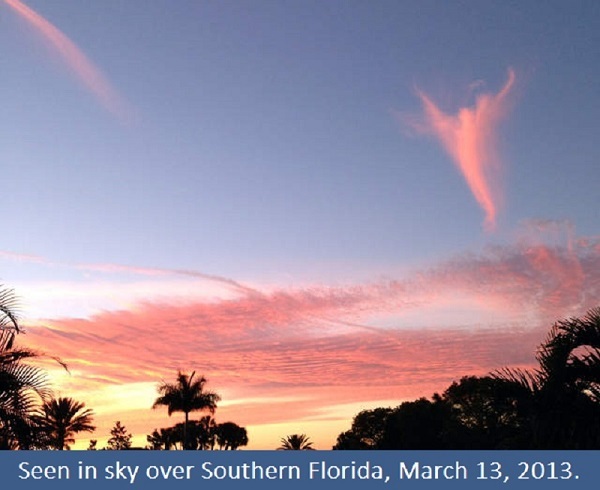 Angels, the last order, are God’s messengers to and guardians of individual human beings. Throughout the lives of “changeable and fallible” human beings, their guardian angels assist them toward goodness. Although the guardians never fail or forsake their human charges, they eschew interfering with Divine providence or with our free will to commit sin if we so choose and to suffer punishment. When I see a drunk or derelict sleeping on a bus bench or curled up in a street corner, I can’t help but wonder how very sad their guardian angels must be. Imagine what it must be like to be the guardian angel of a serial killer . . . . In Summa Theologica, St. Thomas also wrote that at the end of a human being’s earthly life, the guardian angel of the virtuous person will be replaced with an angelic companion because the guardian’s mission will have been successfully discharged. What a wondrous thought — that our guardian angel who has known and loved us all our lives will be our friend and companion through all eternity! 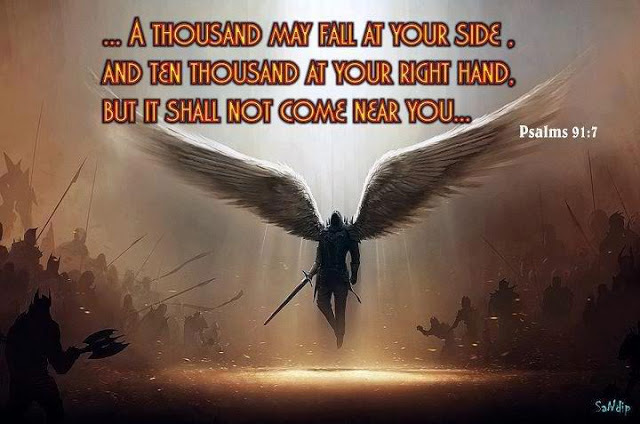 But the wicked in Hell “will have a fallen angel [or demon] to punish him” for eternity. Let that thought sink in . . . .
My days are so busy with blogging and family-, house- and garden-work that the only time when my mind is at rest is when I walk in the hills. On one such walk several years ago, I talked to my guardian angel and humbly asked him to show me he’s there. Instantaneously, I felt his presence walking alongside me, on my right. I can’t tell you what he looks like (he is a bodiless spirit after all), but what I felt was his staggeringly-profound LOVE — a love that is unconditional and wholly unearned, the depths of which I have never (and will never) experienced from any human. Talk to your Guardian Angel! He loves you very, very much, more than you’ll ever know. And thank your Guardian Angel today and every day — for watching over and protecting you, and for loving you in spite of ourselves. September 29 traditionally was set aside as the Feast Day of St. Michael the Archangel. Then the Church made it the feast day of all the Archangels. Note: The word “saint” simply means “holy” — as indeed are the Angels who choose to be true to God instead of, like Lucifer and the other fallen angels, pride in themselves. Angels are incorporeal (without body, material form or substance) spiritual beings who act as messengers and intermediaries between God and humanity. St. Augustine said that although Angels are defined by their function as messengers or message-bearers, their activities are not limited to just this function. Messenger is one of their functions, not their nature. St. Thomas Aquinas maintained that each Angel is unique, a species unto itself — truly a mind-boggling idea. That leaves the orders of Virtues and Powers who, by logical inference, minister to other bodily but nonhuman creatures — a category that would include animals, whom St. Bonaventure insightfully called “creatures without sin,” as indeed they are without the concupiscence of Original Sin that stains every human. That our pets and other animals have Angels is a happy thought indeed! Michael: in Hebrew, the name means “Who is like God?”. Gabriel: “God is my might”. Archangel Gabriel appears to Mary. 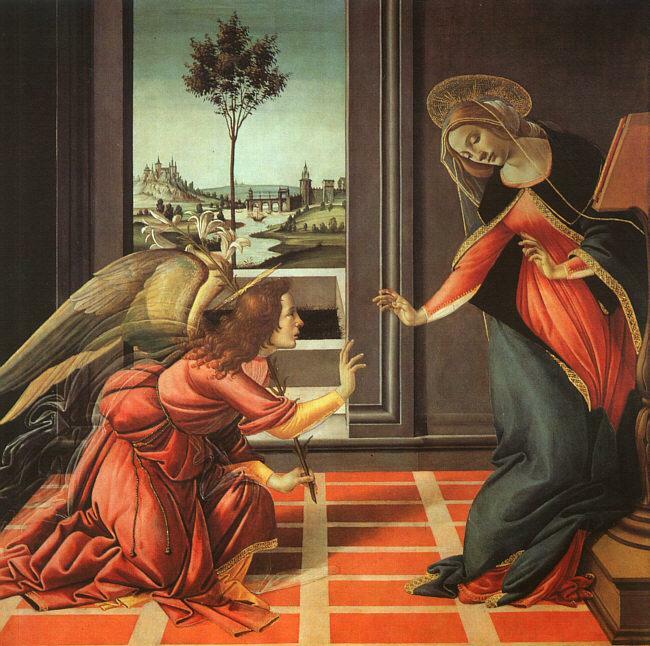 The Annunciation by Sandro Botticelli, 1485. To the prophet Daniel (Daniel 8:16). To the priest Zechariah to foretell and announce the miraculous birth of John the Baptist (Luke 1:19). To the Virgin Mary to tell her that she would conceive and bear a son (Luke 1:26–38). As the angel of the Annunciation, Gabriel is the one who revealed that the Savior was to be called “Jesus” (Luke 1:31). St. Gabriel is recognized as the patron saint of messengers, telecommunication workers, and postal workers. The angel Raphael‘s name means “God heals.” This identity came about because of the biblical story that Raphael “healed” the earth when it was defiled by the sins of the fallen angels in the apocryphal Book of Enoch. Raphael appears by name only in the Book of Tobit where, disguised as a human named “Azarias the son of the great Ananias,” he accompanies Tobiah, son of Tobit, in travels. When Raphael returns from his journey with Tobiah, he declares to Tobit that he was sent by the Lord to heal his blindness and deliver Sarah, Tobiah’s future wife, from the demon Asmodeus. It is then that Raphael makes himself known as “the angel Raphael, one of the seven, who stand before the Lord” (Tobit 12:15). Although only the archangels Gabriel and Michael are mentioned by name in the New Testament, the Gospel of John 5:1-4 speaks of a healing pool at Bethesda where “An angel of the Lord descended at certain times into the pond; and the water was moved. And he that went down first into the pond after the motion of the water was made whole of whatsoever infirmity he lay under.” This passage is generally associated with Archangel Raphael. St. Raphael is the patron saint of travelers, the blind, bodily ills, happy meetings, nurses, physicians and medical workers. He is often pictured holding a staff and either holding or standing on a fish. But Lucifer admires and loves himself more than his Creator and thinks himself to be “as God.” And so, swollen with narcissism and grandiosity, Lucifer rebelled, taking a third of the angelic beings with him. That braveheart’s name is Micha-el, which means “Who is like God?” — Michael‘s battle cry. St. Michael the Archangel is the prince of the heavenly hosts and the most beloved of all the angels. He is mentioned in Daniel 10:13,31; 12:1 (where he is said to be the prince of the people of Israel); Jude 9 (where he disputed with the Devil about the body of Moses); and in Revelation 12:7 (where he led the heavenly armies against those of the “great dragon”). Patron of the Chosen People in the Old Testament. Patron saint and defender of the Church. The Angel of death, who assists Jesus in the final judgment (thus, Michael is sometimes depicted with a scale). All of which is why St. Michael, the Braveheart of Angels, is my most favorite saint, whom I admire and love with all my heart. He is my commander in chief. 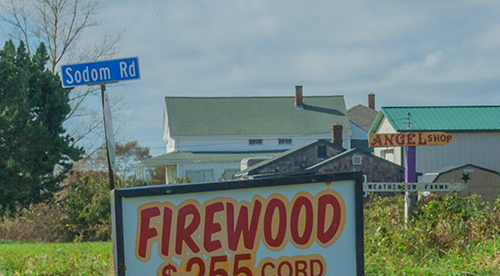 As you can see from this blog’s masthead, he is also the patron and protector of Fellowship of the Minds. Happy Feast Day, St. Michael, St. Raphael, St. Gabriel! Thank you for inspiring us with your humility, courage, goodness, and love for God. Please help us in our struggles in this present darkness. Thank you, God the Father, the Son, and the Holy Spirit, for creating the marvelous Angels! For a fascinating account of a U.S. Marine’s encounter with Archangel Michael in the Korean War, click here. Mortimer J. Adler, The Angels and Us (New York: Macmillan, 1982). Matthew Bunson, Angels A to Z: A Who’s Who of the Heavenly Host (New York: Three Rivers Press, 1996), pp. 181-184. Michael H. Brown, Prayer of the Warrior (Goleta, CA: Queenship Publishing Co., 1993), p. 34. René Descartes, Meditations On First Philosophy, trans. by Donald A. Cress (Indianapolis & Cambridge: Hackett Publishing Company, Inc., 1979). Summa Theologica of St. Thomas Aquinas, Volume One (New York: Benziger Brothers, 1947). Angels are incorporeal (without material bodies or subtance) spiritual beings who act as intermediaries between God and humanity. Although the word “angel” means “messenger,” this does not limit their activities. Instead, they are created by God to serve Him by fulfilling any and all tasks assigned to them. St. Thomas Aquinas maintained that each Angel is unique, a species unto itself — a truly mind-boggling idea. (Sidenote: J.R.R. Tolkien’s Ents are analogous, in that each Ent is also a species unto itself.) That means each Angel is truly an individual, with his own personality and quirks. This may explain why some guardian angels are pro-active, while others are not. Principalities are in charge of the whole of humanity — of nations or countries. Angels, the last order, are God’s messengers and guardians of individual human beings. Note: By logical inference, then, the orders of Virtues and Powers minister to nonhuman bodily creatures, which would include animals whom St. Bonaventure called “creatures without sin.” Isn’t that a happy thought? — that our pets also have angels? Throughout the lives of “changeable and fallible” human beings, their guardian angels assist them toward goodness. Although the guardians never fail or forsake their human charges, they eschew interfering with Divine providence or with our free will—to commit sin if we so choose, to endure trials and troubles, and to suffer punishment. In Summa Theologica, St. Thomas also wrote that at the end of a human being’s earthly life, the guardian angel of the virtuous person will be replaced with an angelic companion because the guardian’s mission will have been successfully discharged. What a wondrous thought: That our Guardian Angel who has known and loved us all our lives will be our friend and companion through all eternity! You’ll find more angel stories on FOTM‘s “Angels & Saints” page. My days are so busy with blogging and family-, house- and garden-work that the only time when my mind is at rest is when I’m taking my solitary walk in the hills. On one such walk several years ago, I talked to my guardian angel and humbly asked him to show me he’s there. Instantaneously, I felt his presence walking alongside me, to my right. I can’t tell you what he looks like (he is a bodiless spirit after all), but what I felt was his staggeringly-profound LOVE — a love that is unconditional and wholly unearned, the depths of which I have never (and will never) experienced from a human. Today is the Archangels' feast day! Note: The word “saint” simply means “holy’ — as indeed are the Angels who choose to be true to God instead of, like Lucifer and the other fallen angels, pride in themselves. Angels are incorporeal (without body, material form or substance) spiritual beings who act as messengers and intermediaries between God and humanity. St. Augustine said that although Angels are defined by their function as messengers or message-bearers, their activities are not limited to just this function. Created by God to serve Him, Angels fulfill any and all tasks assigned to them. In other words, being an Angel or messenger simply denotes one of their functions, not their nature. St. Thomas Aquinas maintained that each Angel is unique, a species unto itself — truly a mind-boggling idea. That leaves the orders of Virtues and Powers who, by logical inference, minister to other bodily but nonhuman creatures. The latter would include the non-human animals, such as our pets, whom St. Bonaventure called “creatures without sin” — which is a happy thought indeed! Raphael appears by name only in the Book of Tobit where, disguised as a human named “Azarias the son of the great Ananias,” he accompanies Tobiah, the son of Tobit, in travels. When Raphael returns from his journey with Tobiah, he declares to Tobit that he was sent by the Lord to heal his blindness and deliver Sarah, Tobiah’s future wife, from the demon Asmodeus. It is then that the Raphael makes himself known as “the angel Raphael, one of the seven, who stand before the Lord” (Tobit 12:15). Although only the archangels Gabriel and Michael are mentioned by name in the New Testament, the Gospel of John 5:1-4 speaks of a healing pool at Bethesda where “An angel of the Lord descended at certain times into the pond; and the water was moved. And he that went down first into the pond after the motion of the water was made whole of whatsoever infirmity he lay under.” This passage is generally associated with St. Raphael, the Archangel. 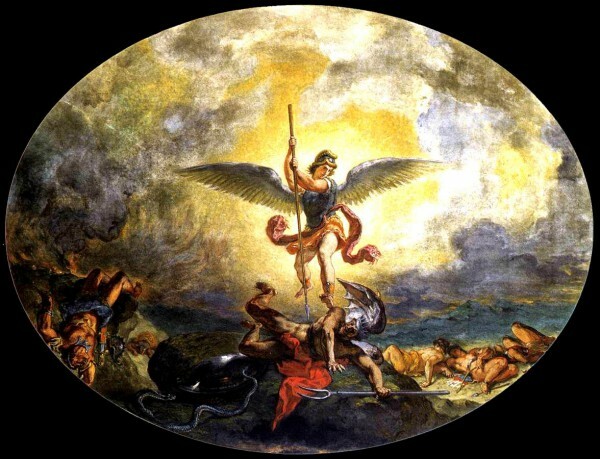 The name “Lucifer” means “morning star,” “son of the dawn,” or “light carrier.” For that reason, theologians believe that Lucifer was a high-order Angel, most likely the highest order — a Seraphim. Aquinas thought him to be “probably the highest of all the angels.” But Lucifer admires and loves himself more than his Creator and thinks himself to be “as God.” And so, swollen with narcissism and grandiosity, Lucifer rebelled, taking a third of the angelic beings with him. 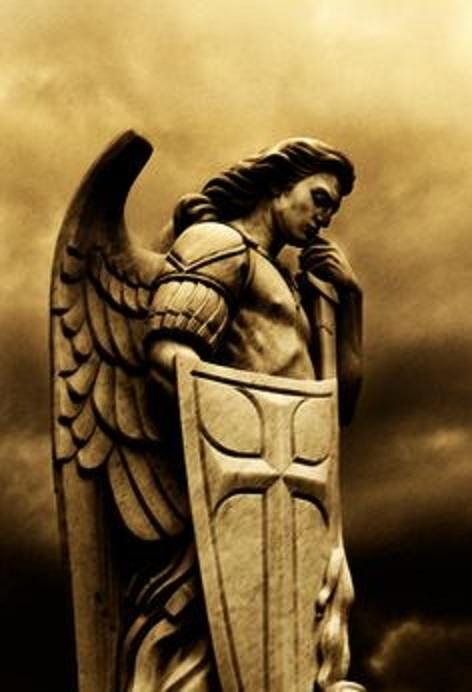 St. Michael the Archangel is the prince of the heavenly armies and the most beloved of all the angels. He is mentioned in Daniel 10:13,31; 12:1 (where he is said to be the prince of the people of Israel); in Jude 9 (where he disputed with the devil about the body of Moses); and in Revelation 12:7 (where he led the heavenly armies against those of the “great dragon”). 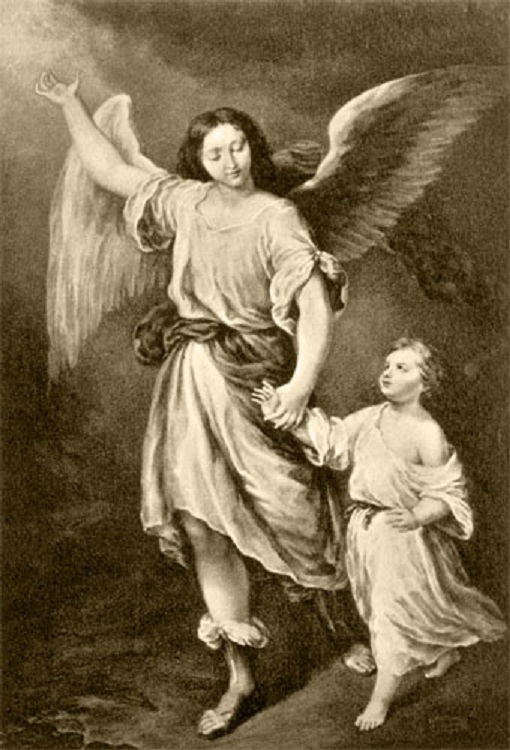 Happy Feast Day, St. Michael, St. Gabriel, St. Raphael! Thank you for inspiring us with your humility, courage, goodness, and love for God. For a fascinating account of one man’s experience with the Archangel Michael, click here. Check out FOTM‘s other angel posts here! So what was the serpent’s strategy? It was to trick the humans into doing what he had done: to disobey and rebel against God. Adam! You were with her the whole time! Well, Adam and Eve, hows that “gaining wisdom” thing working out. You became to “smart” that you realized you were naked. Yup Adam not only blamed his wife, he blamed God. Smooth move, Adam. Did anyone notice the first Messianic prophecy in the Bible? A sad day for animals. An indication that blood would have to be shed for redemption. So the Lord God banished him from the Garden of Eden to work the ground from which he had been taken. After he drove the man out, he placed on the east sidee of the Garden of Eden cherubim and a flaming sword flashing back and forth to guard the way to the tree of life. That, boys and girls, is how things got this way. Then the angel showed me the river of the water of life, as clear as crystal, flowing from the throne of God and of the Lamb down the middle of the great street of the city. On each side of the river stood the tree of life, bearing twelve crops of fruit, yielding its fruit every month. And the leaves of the tree are for the healing of the nations. No longer will there be any curse.